Mickey Mouse is one of the most popular Disney cartoon characters, which is why a Mickey Mouse poster dating to 1928 fetched a price of $100,000 at an auction. The character of Mickey Mouse was created by Walt Disney and Ub Iwerks in 1928, and soon appeared in a few silent cartoons, which unfortunately remained undistributed. Of course, later on, the Mickey Mouse cartoon character became very famous. With its trademark large yellow shoes and red shorts, Mickey Mouse appeared in more than 130 films, and even became the first cartoon character to have its own star on the famous Hollywood Walk of Fame. I remember watching quite a lot of Mickey Mouse cartoons as a child. Items related to Mickey Mouse are highly prized collector’s items, and the owners of this rare vintage Mickey Mouse poster are sure to have realised that, when their old Mickey Mouse poster advertisement was bought for $100,000 at an auction. This rare Mickey Mouse movie poster dates back to 1928, and was discovered by the family of a deceased poster collector, in his home in Chico in Northern California. 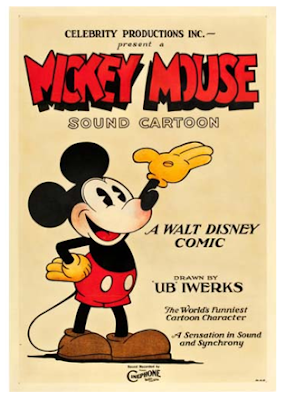 On this poster, is a smiling Mickey Mouse with his hands raised upwards, announcing a ‘Mickey Mouse sound cartoon’. There are also slogans on the poster proclaiming Mickey Mouse as ‘The World’s Funniest Cartoon Character’, and the film as ‘A Sensation in Sound and Synchrony’. The auction of this rare vintage Mickey Mouse poster was done by Heritage Auctions. Said to be an important piece of pop-culture treasure, this rare Mickey Mouse cartoon poster ad was purchased by an anonymous collector in Dallas, Texas for $101,575. What do you think of the sale of this vintage Mickey Mouse item? Do you have anything like it in your home that you would like to auction?